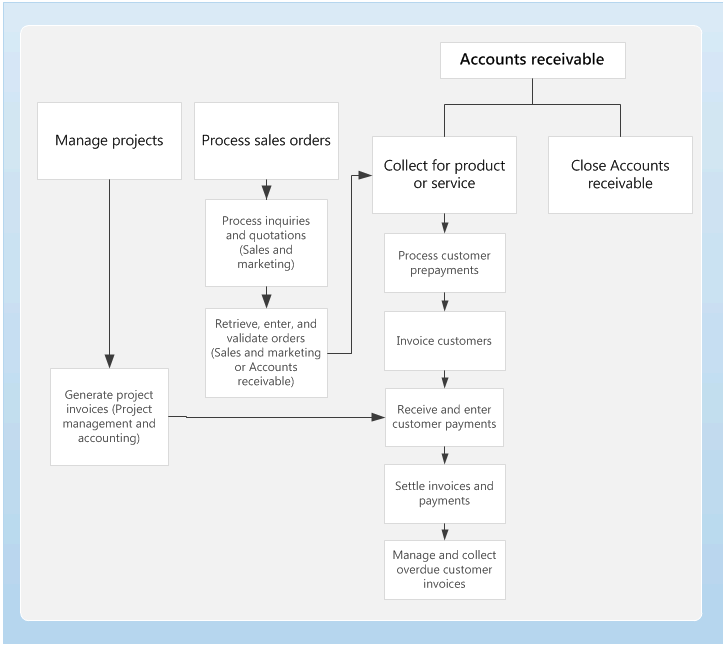 Use Accounts receivable to track customer invoices and incoming payments. You can create customer invoices that are based on sales orders or packing slips. You can also enter free text invoices that are not related to sales orders. You can receive payments by using several different payment types. These include bills of exchange, cash, checks, credit cards, and electronic payments. If your organization includes multiple legal entities, you can use centralized payments to record payments in a single legal entity on behalf of the other legal entities. Use Accounts receivable to track customer invoices and payments that you receive from customers. You can set up customer groups, customers, posting profiles, interest notes, collection letters, commissions, and parameters regarding customers, charges, deliveries and destinations, bills of exchange, and other types of Accounts receivable information. Accounts receivable collections information is managed in one central view, the Collections page. Credit and collections managers can use this central view to manage collections. Collections agents can begin the collections process from customer lists that are generated by using predefined collection criteria, or from the Customers page. Accept different types of payments from customers, such as bills of exchange, cash, checks, credit cards, and electronic payments. Go to the Microsoft Dynamics 365 Roadmap to see what new features are planned. You can find opinions, news, and other information about Accounts receivable and other solutions on the Microsoft Dynamics 365 blog and the Microsoft Dynamics 365 Finance and Operations - Financials blog. The Microsoft Dynamics Operations Partner Community Blog gives Microsoft Dynamics Partners a single resource where they can learn what is new and trending in MBS Operations. Additional help is available as task guides inside Finance and Operations. To access task guides, click the Help button on any page. Check out the how-to videos that are now available on the Microsoft Dynamics 365 YouTube Channel.